With a food-centric philosophy, Choice Market launches to conveniently feature grocery items and fresh-prepared foods. A food-industry veteran is opening a new hybrid convenience-store/fast-casual restaurant in downtown Denver that seeks to tap into many of the trends driving food purchasing in today’s environment. Founder and CEO Mike Fogarty said he was inspired to create the Choice Market concept, which is slated for a grand opening on Friday, after shopping at small-format grocery stores in Europe. Fogarty, who worked in restaurants throughout high school and college, most recently held positions in procurement at WhiteWave Foods, a division of Danone. Growing up in the Philadelphia area, where the foodservice offerings at c-store chain Wawa have a strong reputation, also influenced the development of Choice Market, he said. Kevin Ward, a veteran chef whose experience includes stints at the Purple Pig in Chicago and Longs Peak Pub in Longmont, Colorado, is general manager and culinary leader at Choice Market. He has created a menu that includes a variety of sandwiches, flatbreads, bowls, salads and other fare that rely heavily on sourcing from local purveyors such as Aspen Ridge, Fruition Farms, Tender Belly and Red Bird. Examples of the on-trend menu items include the BBQ Pork Bowl, made with slow-roasted Tender Belly pork shoulder, Breckenridge Bourbon BBQ sauce, green chili mac and cheese and mustard slaw, and sandwiches such as the Local Meatball, made with Tender Belly pork, Alpine Ridge beef, and Polidori sausage meatballs, marinara, sunflower seed basil pesto and Fruition Farms ricotta on a hoagie roll. All meats are antibiotic free and nitrate free, and the menu also includes several vegetarian options. Bread is sourced from local bakeries. 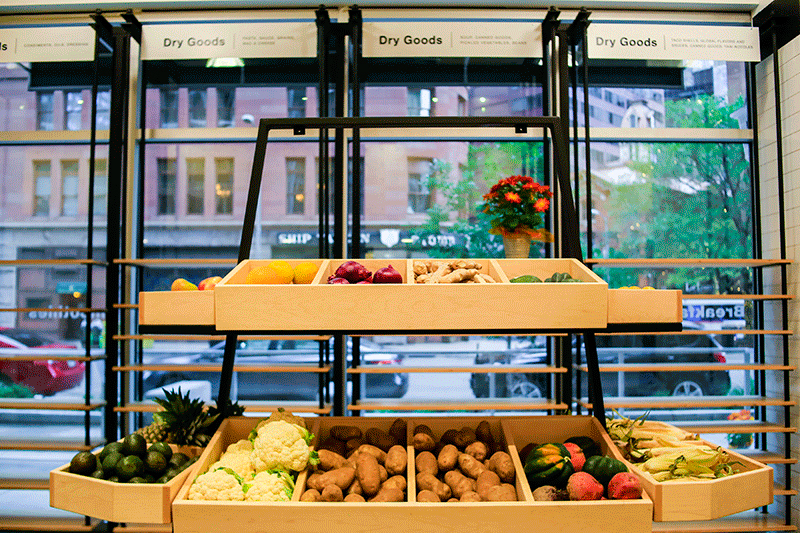 Choice Market combines prepared food offerings with perishable sales. Beverages include smoothies, a specialty coffee program from local provider Corvus Coffee Roasters, and carbonated drinks from the Rocky Mountain Soda Co.
Prices run from about $8 to $14 for most prepared items, although the store will also offer some lower priced, premade options. The store is located in an apartment building, but the area overall is dominated by businesses. As a result, Fogarty expects a lot of breakfast and lunch traffic, particularly on weekdays. The store staffs about 17 to 18 people, most of whom are involved in food preparation. Fogarty said he believes launching the business with a food-centric mindset gives him an edge over c-stores that were not designed with foodservice in mind. “We knew we had to have the right equipment and the right infrastructure in place to execute [our model],” he said. John McCauley, director of branding at Fort Worth, Texas-based Paragon Solutions, which does design and branding work for the c-store industry, said operators in this segment often have to start over from the ground up when they seek to implement a strong foodservice program. More and more convenience stores are implementing fresh-made foodservice programs, and seeking to tap into current food preferences around responsible sourcing and better-for-you offerings, according to McCauley. Although the initial Choice Market location does not offer gasoline, Fogarty said he envisions future locations will be paired with “a different type of fuel station” that provides electric charging stations and bike- and car-share services. Future locations will also be larger, he said, at around 4,000 to 5,000 square feet, with seating for customers to dine, perhaps while their electric cars are charging. He is seeking to open additional locations in Denver, as well as in Wisconsin and other areas of the Western U.S.
“Hopefully we are creating something new and different that we can replicate here in Denver and throughout the country,” Fogarty said.